Used sitting bunny plastic mold, has minor wear and tear. 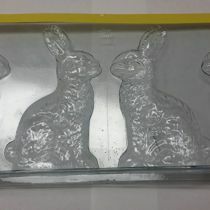 There are 4 bunnies in each mold. This mold has a closed bottom.